Oh how I love having three days off in a row... and I am lucky because I usually get three off in a row at least once a week... 12 hour shifts stink, but having that many days off in a row is a plus! Well our mission this week is to find a crib for Hudson's room. We want one that is dark wood and high backed, and in good condition... we've looked on craigslist, with no luck so far... so any other suggestions would be great... we just may have to end up buying one new... I feel very behind on the nursery... but we're getting there. 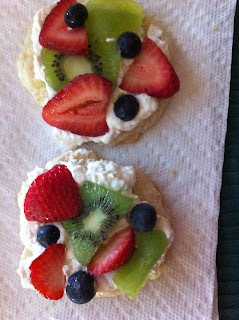 I have also added a picture of my new guilty pleasure... mini fruit pizzas... yummy! i like them better than the big fruit pizzas because you can just make as many as you want and refrigerate the stuff and nothing gets soggy! Work tomorrow and then moving out of the Pate's house and in with my parents on Wednesday... only a few more days until we're back at "our" house... and then the nursery fun begins. yay! how do you make these fruit pizzas? They look fabulous!